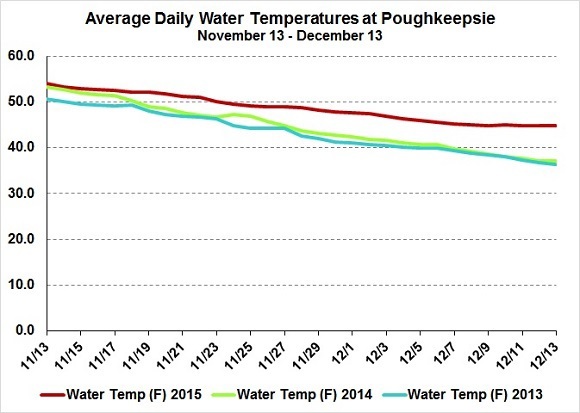 It was a week of record and near record air temperatures in the Hudson River watershed. Our gray seal, rescued from the Hudson River in Saratoga County on December 4, continued its amazing story of recovery and adventure. 12/7 - Riverhead, Long Island: The Riverhead Foundation discovered that our gray seal, bearing a yellow tag number 979 when rescued from the Hudson River in Saratoga County, had been to their facility once before. On April 9, 2015, a beach walker at Robert Moses State Park on Fire Island came upon an injured gray seal stuck inside the rocks of a jetty. He had a broken jaw and an injured rear flipper. The Riverhead Foundation nursed him back to health, force-feeding him at first, and by June 15 he was ready to be released. Their staff named him “Professor X”; at the time, the Foundation was naming their marine mammal releases after comic book characters – Professor X was the creator and leader of Marvel Comics’ “X-Men.” He was estimated to be about 18 months old, probably born in January, 2014, at Sable Island, Nova Scotia – about 800 miles north of .Long island. He weighed 75.5 pounds and was 3 feet, 6 inches long when released at Ponquogue Bridge, Hampton Bays, Long Island. 12/8 - Ulster County, HRM 88: Jim Yates came upon and was able to photograph an immature red-headed woodpecker dining on and collecting acorns this morning. 12/8 - Town of Warwick, HRM 41: It was a soft 40 degrees Fahrenheit as we hiked around Liberty Marsh on its 2.75-mile loop trail. While this wildlife refuge is a critical stopover for migrating waterfowl, there was no sense of urgency in the air. The time when a blue sky would fill with countless V’s of migrating geese would have to wait for another, more threatening, day. The waterfowl we encountered seemed to be content to laze. We found both greater and lesser scaup, ring-necked ducks, buffleheads, common mergansers, black ducks, mallards, and numerous gadwall. A lone northern harrier occasionally lifted up out of the marsh hummocks to teeter for a while before descending, perhaps onto some prey. An adult bald eagle eyeing us from the canopy of a tall hardwood seemed equally at ease. 12/8 - Croton-on-Hudson, HRM 35: I estimated that the count of turkey vultures circling fairly low above downtown Croton-on-Hudson reached 150-175 birds early this morning. There were a lot of “oooohs and aaaahs” from folks going in for coffee at The Black Cow. 12/8 - Riverhead, Long Island: Rescued from the Hudson River, our gray seal was recovering at The Riverhead Foundation on Long Island. However, he was not showing much interest in the squid and herring he was offered and permission was requested from the National Oceanic and Atmospheric Administration [NOAA] to release him into the ocean in the next couple of days. 12/9 - Saratoga County, HRM 180: Among the birds I counted on my survey of Galway Lake today were 600 Canada geese, 250 hooded mergansers, 180 mallards, 24 American black ducks, 16 gadwall, 8 lesser scaup, 7 bufflehead, and 4 green-winged teal. 12/9 - Millbrook, HRM 82: Hudson Valley hardwoods produced a bountiful mast crop this year, primarily acorns, and gray squirrels have been busy shopping for winter. I watched a half-dozen of them scampering around under two large red oaks, and it seemed like they were very caught up in their task. Out from a treeline came a raptor - flap-flap-glide, flap-flap-glide - a Cooper’s hawk. Without a sound or a shadow warning it deftly grabbed a gray squirrel and flew behind a hedgerow to partake of its meal. In this instance, a careless squirrel’s DNA will not produce careless offspring. 12/9 - Riverhead, Long Island: The Riverhead Foundation received permission from NOAA to release our former Hudson River gray seal tomorrow at nearby Hampton Bays. 12/10 - Yorktown Heights, HRM 43: The bird feeders at the Franklin D. Roosevelt State Park were visited today by a beautiful juvenile red-tailed hawk. It landed in a large planter, scattering the small birds from the nearby feeders, and then flapped over to the top of a sign closer to the food source. One tufted titmouse remained, hopping around in the azaleas; we watched with bated breath as it shuttled from one side of the shrubs to the other, looking for a way to escape. Finally, the hawk bent its head to scratch and the titmouse made it to a nearby spruce tree. The hawk eventually flew back to the planter and then away, but it spent over half an hour with us, and it was so close to the park office’s front window that it was easy to see all the field marks. 12/11 - Colonie, HRM 150: I first noticed an immature red-headed woodpecker on Old Valley Road on November 9. It was usually caching acorns from a large crop that had fallen from many oak trees in that neighborhood. I watched many interactions with blue jays, downy, hairy, and red-bellied woodpeckers, robins, and gray squirrels. I was hopeful that it was setting up shop and that throughout the winter I would be able to watch it molt into adult plumage. However, during Thanksgiving week I no longer saw the bird on my daily visits. Clearly it had either departed or changed its pattern. But this morning, the bird was back in its favorite trees. Unlike before, it was clearly foraging for insects, drilling and excavating in several locations. 12/11 - New Scotland, HRM 142: I had 36 black vultures over New Scotland Avenue today. There were two groups: one of 14 birds and one of 22, likely part of the same kettle as they were only about a mile apart. I had seen a kettle two weeks ago in the same area so perhaps this was the same group. I started seeing black vultures in this area on New Year’s Day 2010. 12/11 - Newport, Rhode Island: After his released on December 10 on Long Island, carrying a satellite tag, Charlie was tracked today to Block Island, Rhode Island, about 70 miles to the northeast. 12/12 - Beacon, HRM 61: The season for rod and reel fishing received a weather extension (61 degrees F today) so I gave it a try, although I had to wait more than three hours for my first fish. But it was worth it. I caught, weighed, and released two carp the largest of which was 28.5 inches long and weighed 12 pounds, 15 ounces. The second one was only slightly smaller. The largest carp played “possum” on me. I was eating a sandwich when I saw that I had a nibble - I had been having many of them. I finished my sandwich and then decided to check my bait. As I began to reel in, the big fish was on! 12/12 - Columbia County, HRM 108: Our survey of Copake Lake today counted three lesser scaup (purple head; females had more white around bill than greater scaup), 40 ruddy ducks, 12 hooded mergansers, 4 bufflehead, an American coot, and one adult bald eagle. 12/12 - Ossining, HRM 33: The air was 65 degrees F today, tying the record for the date, and there was certainly a lethargic feeling in the air. In the river off the Mariandale Conference Center, in a sizable raft of scaup, I picked out five canvasback (four were drakes). Redhead ducks were seen here earlier in the week but I did not see any today. 12/12 - Manhattan, HRM 5: Before our walk through Central Park, we came upon a hermit thrush in the Shakespeare Garden. Later, we found many interesting waterfowl: At the Reservoir we counted more than 50 northern shovelers, no less than 100 ruddy ducks, at least 6 bufflehead, and 3 hooded mergansers, as well as ring-necked ducks. 12/12 - Newport, Rhode Island: Our gray seal was tracked today to Newport, Rhode Island, about 100 miles from where he was released just two days ago. Previous notions of seals lingering have to be expanded to include long distance swimming such as this individual has been demonstrating. Hopefully there will be more satellite tracking data to come. 12/13 - Fort Edward, HRM 202: We searched all over the Fort Edward grasslands this afternoon, hoping to photograph the previously reported snowy owl. No luck with the owl, but we did encounter large flocks of wild turkeys (about 50 birds) and a short-eared owl. A large flock of snow geese passed over as well. 12/13 - Saratoga County, HRM 164: Now that we know the date when our gray seal was first released by The Riverhead Foundation on Long Island (June15), we can fill in some of the details of his journey to Lock One on the Hudson River, where he was first sighted on July 25. In the 41 days after his release, it is possible that he fell in with a crowd of harbor seals. He traveled at least 160 miles through the Lower and Upper bays of New York Harbor, and then all the way up the estuary to the Federal Lock at Troy. We assume that he went into the open lock pursuing herring, found himself trapped, and when the lock opened again, he was marooned in the Hudson River above tidewater. 12/13 - Dutchess County, HRM 96: I counted ten red-tailed hawks in a thermal above the Stissing Mountain ridge late this morning. There were no signs of golden eagles, bald eagles, or any other raptors. 12/13 - Kowawese, HRM 59: Following five days of well above average daytime temperatures, we felt we had to go seining. Ably assisted by two third-grade students, Alexia Christoforidis and Alexander Quinci, we hauled the shallows, stumbled over cobbles, and managed to beach the net. The catch was sparse to my eyes but a virtual bounty to Alexia and Alexander. We had a full range of spottail shiners from young-of-the-year to adults 72-112 millimeters [mm] long, as well as many tessellated darters (66-68 mm). The students recognized very quickly that the darters in their coloring mimicked the bottom of the river where they live. The water temperature was holding at 47 degrees F and with only 0.41 inches of precipitation over the last 23 days, salinity was still measurable at 1.5 parts-per-thousand. 12/13 - New York City, HRM 5: The air temperature reached 67 degrees F today, a record high temperature for the date. 12/13 - Manhattan, HRM 5: On our bird walk through Central Park today we came upon 150 ruddy ducks, 87 northern shovelers, 5 bufflehead, 5 hooded mergansers, and 2 double-crested cormorants at the Reservoir. Karen Evans also found a male ring-necked duck on the west side of the Reservoir. 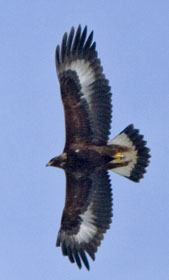 37th annual Mid-Winter Bald Eagle Survey for the Hudson River watershed. We would like to know if you come upon either bald eagles or golden eagles. Details are always important, such as location, adult or immature plumage, behavior, and social interactions. Please email your stories to Tom Lake trlake7@aol.com. The bad-weather date will be Saturday, January 9. Hudson Valley Bald Eagles: One of Our Greatest Ecological Recoveries, presented by Tom Lake, NYSDEC Hudson River Estuary Program consulting naturalist, at the Guilderland Public Library, 2228 Western Avenue, Guilderland [Albany County]. Sponsored by Audubon Society of the Capital Region (ASCR). For information, email president@capitalregionaudubon.org . The current year's issues are available at http://www.dec.ny.gov/lands/25611.html . To view older issues, visit the New York State Library's Hudson River Almanac Archive. If it asks you to login, click on "Guest." You may then need to reopen the DEC Almanac page and click on the Almanac Archive link again to access the Almanac collection in the library's files. Discover New York State Conservationist - the award-winning, advertisement-free magazine focusing on New York State's great outdoors and natural resources. Conservationist features stunning photography, informative articles and around-the-state coverage. For a free, no-obligation issue go to http://www.dec.ny.gov/pubs/conservationist.html.